Discover the origin of the Tolix Brand. 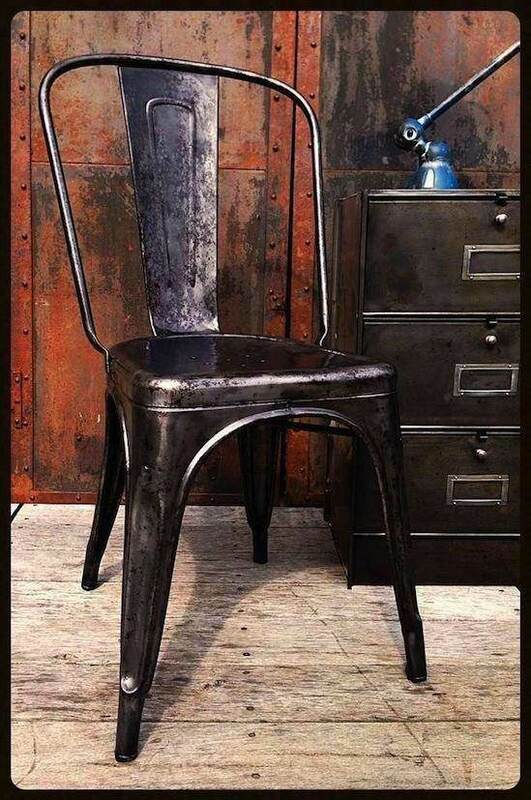 It’s the story of a metallic chair recognized worldwide as one of the symbols of the French Industrial Design. 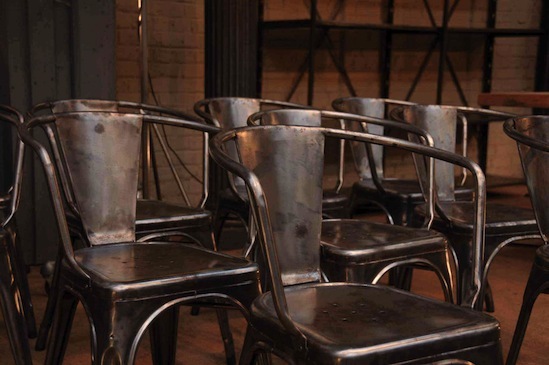 The Model A chair has become an icon of Industrial Aesthetics. It’s unfailing popularity since 1934 has enabled to enter the Collections of the Vitra Design Museum, MOMA and the Pompidou Center. This mythical chair, crafted of steel sheets, has been assured by «its fool-proof solidity, its unequalled lightness and its easy maintenance. Everything started with the aim to answer to the needs of brewers. They were demanding clients and represented the largest share of the Pauchards’ turnover. The need were huge as In 1930, in France you could find 1 café for 50 people, in 1950 there was still 1 café for 120 people. “Making space profitable, putting as many drinks as possible on the tables and optimizing the back and forth journeys of the waiters; turning café terraces into profitable business was the challenge of my family” Xavier Pauchard. Pauchard finds the right answer. The pedestal table’s edged top could accommodate four glasses of beer and their mats, four coffees, plus an ashtray and bill saucer. The cast iron base was hidden under the table; the chairs were stackable and café terraces suddenly became a lot more profitable! All merit goes to Xavier Pauchard (1880-1948) who was a pioneer of galvanisation in France. Shortly after World War 1, based in Autun, Burgundy, he found himself (a visionary and inventive entrepreneur) in charge of a flourishing manufacture of galvanised sheet-metal domestic items, which at the time, embodied household comfort. It was in 1927 that he registered the trademark TOLIX, at the same time converting to the «production of chairs, armchairs, stools and metal furniture». Its first version doesn’t present any stiffener (from 1930). The stiffeners for the feet appear in 1938, the ones for the “palmette” (back chair) with a shape as a “U” upside down, appear in the 60s. 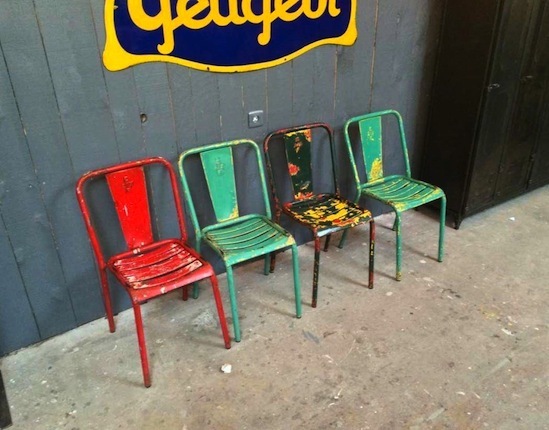 These successive adaptations were used to decrease the cost of the chair. It also had, like all others items, the same reinforcement crosspiece “X” under seat. The seating is plain with only 7 little holes. The brand Tolix is embossed on the back of the chair (it appeared very lately) and can attest the original or not, and date the others which don’t have any brand on them. 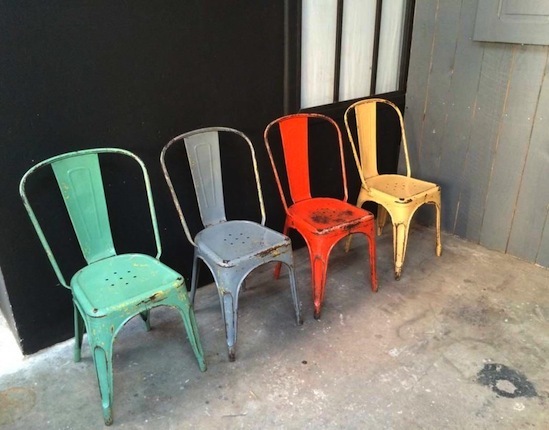 Gorgeous Vintage Tolix A Chair with great colors! The “Model B” presents a back more round and the feet are thinner than the A chair. Otherwise it’s the same as the “Model A”. 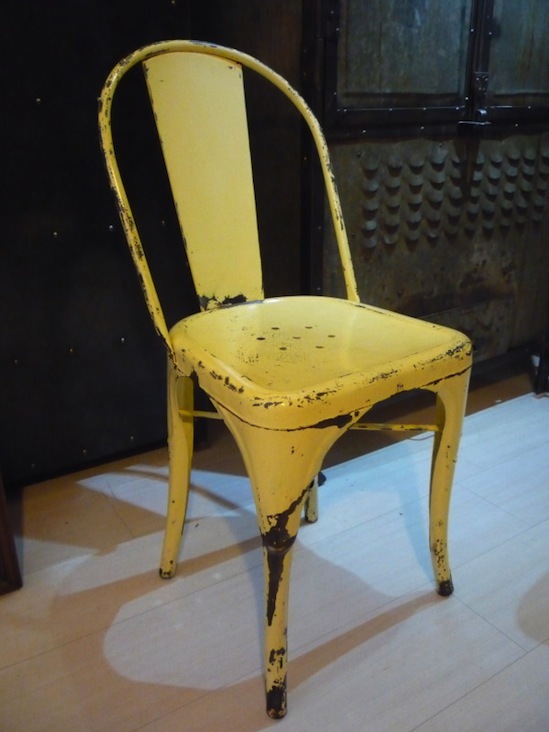 Beautiful Yellow Tolix B Chair with a perfect patina! The armchair “C” presents almost all the same characteristics of the “A” chair. But has two simultaneous bending tubes for its armrests. A work still done by craftsmen today. It also has reinforcement on both sides. A lovely stylish look, perfect in every room of you home! Those Tolix Armchair C are just stunning! Look at this patina! It is a “A” chair without its back technically. It has a stamped basis, convex feet provide with stiffeners (but not in the quite first editions, that it’s thus necessary to hunt for antiques!). As it is stackable, you can buy as much as you need, they won’t take too much space and will look so nice! Great Tolix Stools H so stackable, no need to hide! Jean Pauchard (son of Xavier Pauchard) is the designer of the Tolix “Type A56” chair. 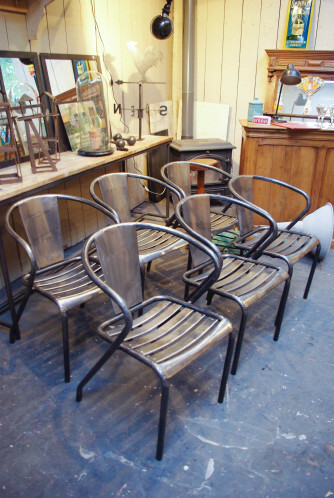 Twenty-five of these chairs could be stacked together and still measure less than 2.3 m (7 ft 6 in.) in height. 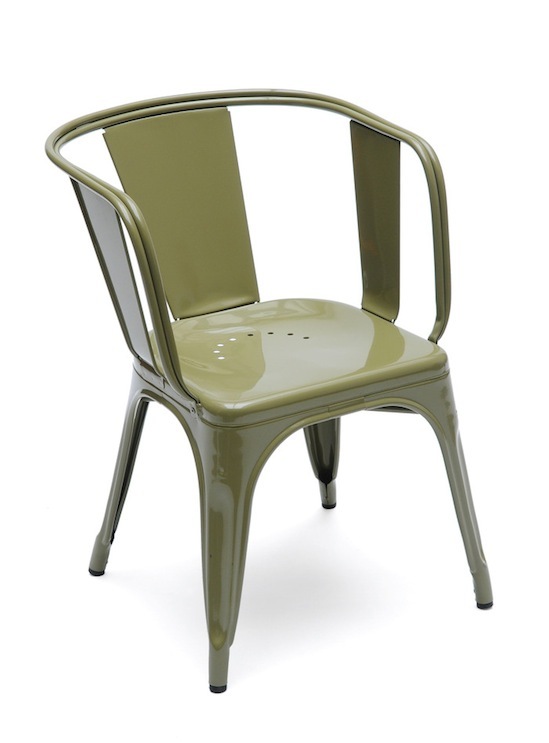 This chair was created in response to remarks made by café owners about the Tolix Model C and D chairs, which they thought were too bulky, reducing the space for tables and resulting in a drop in customers. ”I just added an extra backrest section to the Model A chair, and, as it was 1956, I named it A56”. Jean Pauchard. Tolix A56 Armchair is really The perfect armchair! The Tolix armchair “Model FT5” is half a chair, half an armchair, the feet are round, like tubes, not like all other types and the seating has small strips instead of being plain. They look really great in a garden! Fluid lines, just a beautiful armchair is this Tolix FT5! This one was created in the 40’s. It is straighter than the others and the seat is also with small strips. This model is close to the FT5 armchair, but just in a chair. 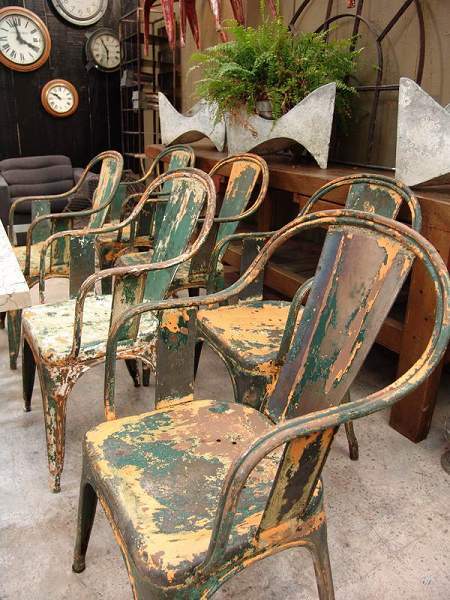 It looks beautiful in a garden with its original paint, but also great in any contemporary, country home or any interior style when it’s completely stripped out. Those Tolix T4 would look amazing even in a kitchen! The Tolix “Model D” is the same as the A56 but it has reinforcement on both sides and the sit is plain with 8 little holes in half a circle. It also has two simultaneous bending tubes for its armrests like the Armchair “C”. It gives it a look very strong. It is also heavier than the A56. It would fit perfectly in any interior as a dinning chair or even a desk chair! Buy it now and it will last for ever! This Tolix D Armchair is fantastic, but couldn’t find any nice vintage pic! If you have one, please send it to me! This entry was posted in Industrial Furniture and tagged Tolix by helene. Bookmark the permalink. My favourite is the A56. I’m curious to know what’s involved in the manufacturing process – and is there a difference since the 1950s and today? 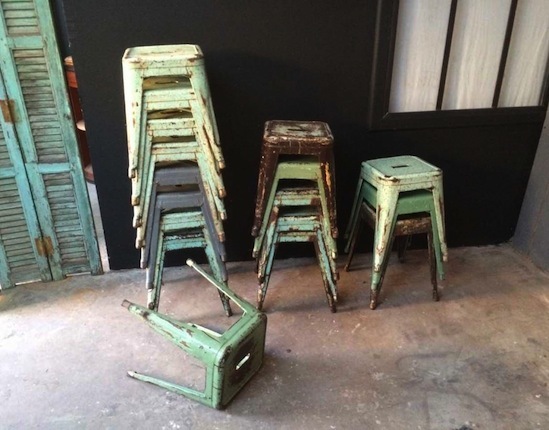 Humm… Yes I love the A56, but the H stool awesome! And I will come back with some details about today’s production! That would be incredible! Looking forward to hearing back. Keep up the great posts.